Just a quick recap from Tuesday evening (December 13, 2004) at the Syndicate Conference. 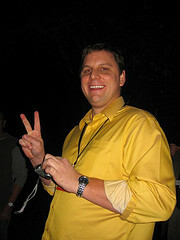 After the structured blogging announcement I blogged about previously on SwF, I headed to the Yahoo networking reception where I had the pleasure of finally meeting Niall Kennedy of Technorati and Michael Arrington of TechCrunch. These are just couple of gentlemen I have interacted with online but never got to actually meet in person. Additionally, Michael was snapping some photos and caught my ugly mug in this photo with a new acquaintance, Jennifer Allen, from Eurekster. Ironically, I have used Eurekster's Swicki product recently in a post on SwF titled What is Swicki? so it was nice to finally meet someone from Eurekster. I attended an after party in a penthouse suite filled with superb wine, port and scotch hosted by the good folks at Pluck (Dave Panos and company). At the after party I met several other Syndicate attendees including another midwesterner in Dan Hickey from Meredith Corporation (which owns Better Homes and Gardens among other publications). After a fabulous party by Pluck, I headed with some of my new acquaintances to the Cellar, a local establishment a few blocks away to attend a launch party for a new RSS Reader which incorporates some aspects of social networking called Gritwire. I met Ian Carswell the founder and COO of Gritwire and actually got a personalized demo. I found the RSS reader to carry many of the same features of any other reader. However, one thing I did find distinguishable was the fact that the reader was flash based which is different from the typical Ajax based reader solutions I am accustom to seeing. In watching the demo I found out Ian is a fellow Illinois resident since Gritwire’s office is in Evanston, Illinois which is where I received my graduate degree from Northwestern. 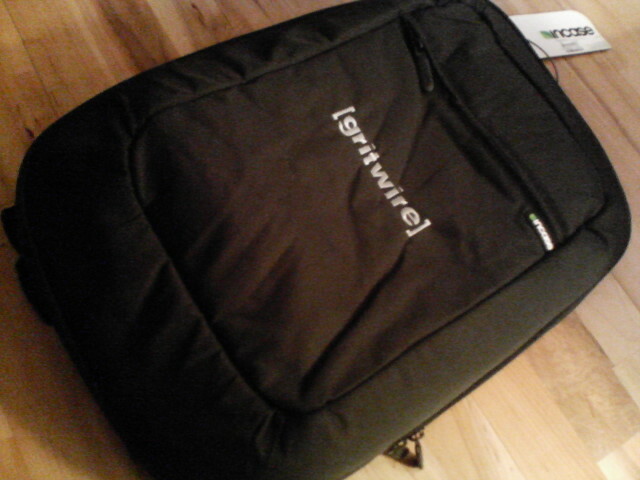 As a door prize for for heading to the launch party, Gritwire gave out laptop bags as shown the left. A very nice touch. UPDATE: Ian has posted recently on the Gritwire blog in regard to the launch party. After a long day I decided to wander back to the San Francisco Hilton and to get some much needed dinner from the Lobby Bar and then returned to my room to recap my notes on the day and check in with the blogosphere. A blog post later, I finally, got headed to bed after an eventful day at Syndicate.